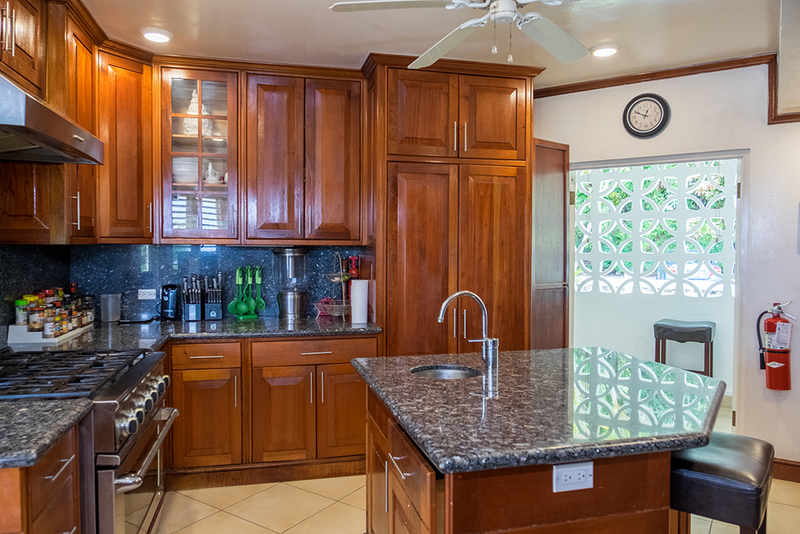 Nutmeg is a charming 6 bedroom villa in the upscale residential neighborhood of Spring Farm ~ just five minutes from three world-class golf courses, designer shops, bars, restaurants and beaches. 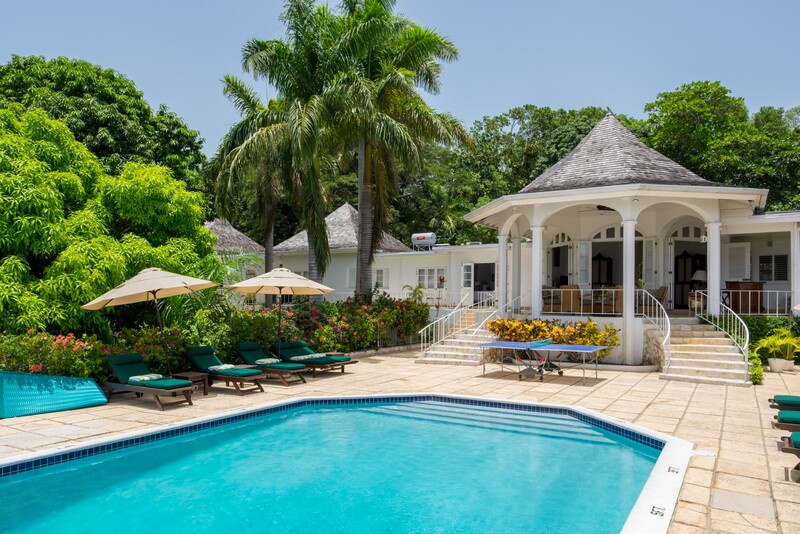 Half Moon Resort Beach Membership - Use of Sunrise Beach, Hibiscus and Oleander Pools, Jacuzzi, tennis courts, Fitness Center, Croquet, Miniature putting green. Advance booking in all restaurants and Spa treatments. 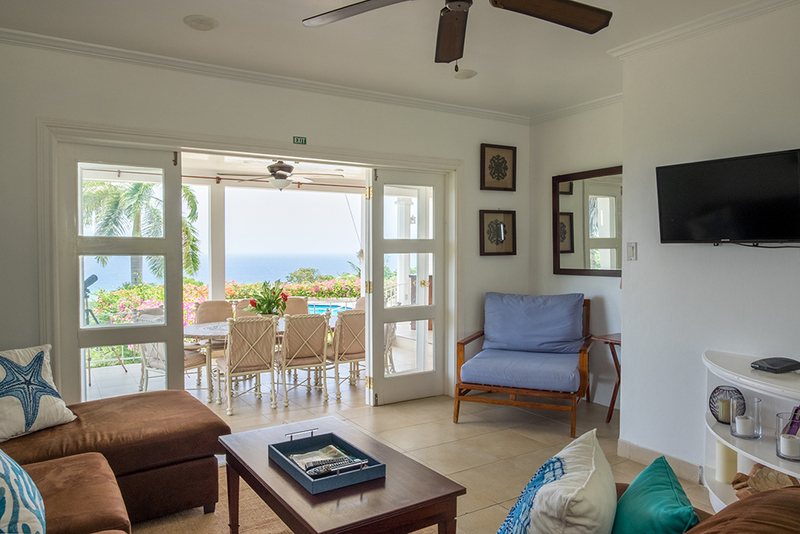 Enter this lovely vacation villa through carved entrance doors with antique brass fittings and the magnificent view is immediately apparent. 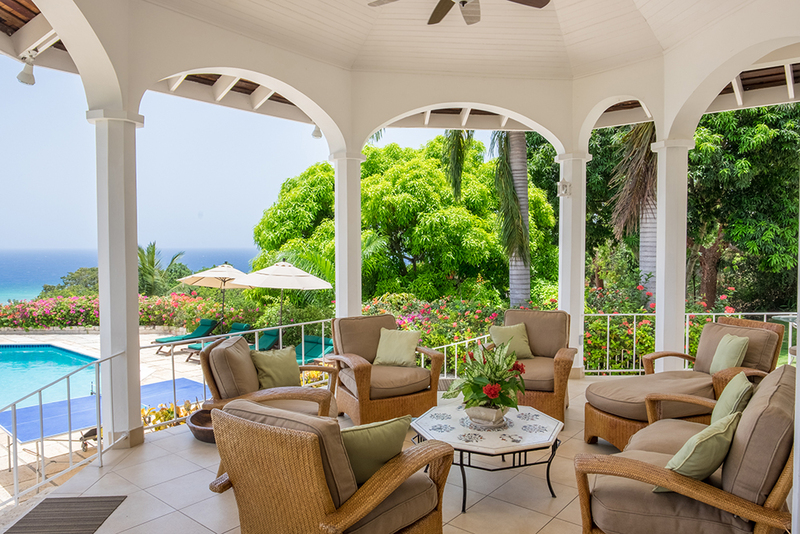 The view becomes more dramatic as one moves through the large living room to the shaded verandah ~ and beyond to the private pool and large lawn. 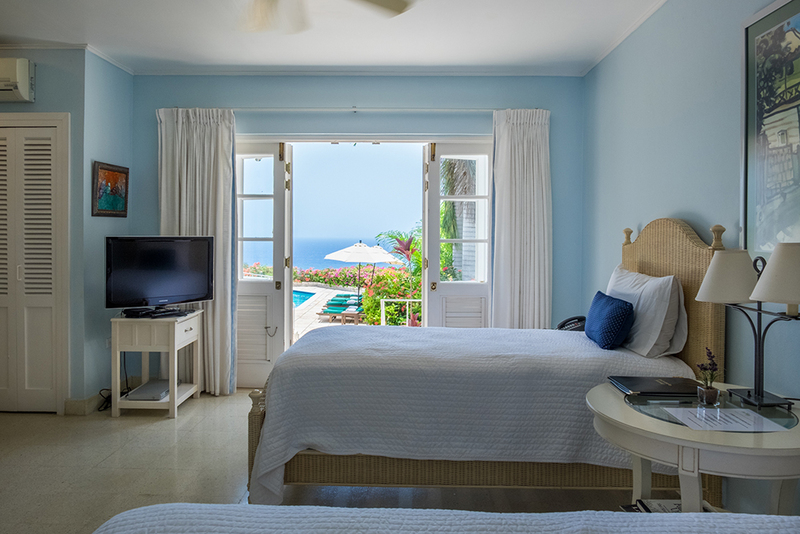 The view from Nutmeg of the deep blue Caribbean Sea is simply breathtaking. Five acres of tropical gardens are lush with flowers, oranges, limes, lemons, June plum, breadfruit, grapefruit, avocado and mango. This large lawn is a wonderful playground for children. 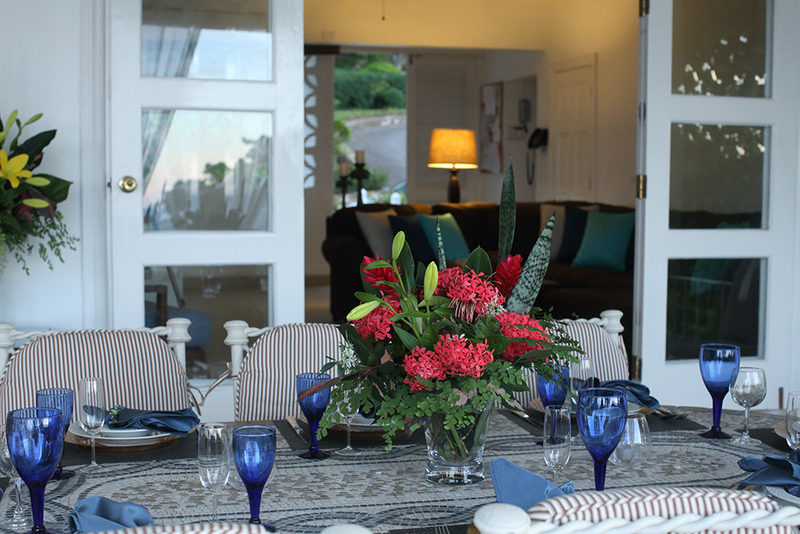 Adjoining the verandah is the covered al fresco dining terrace for delicious meals prepared by the Nutmeg cook. 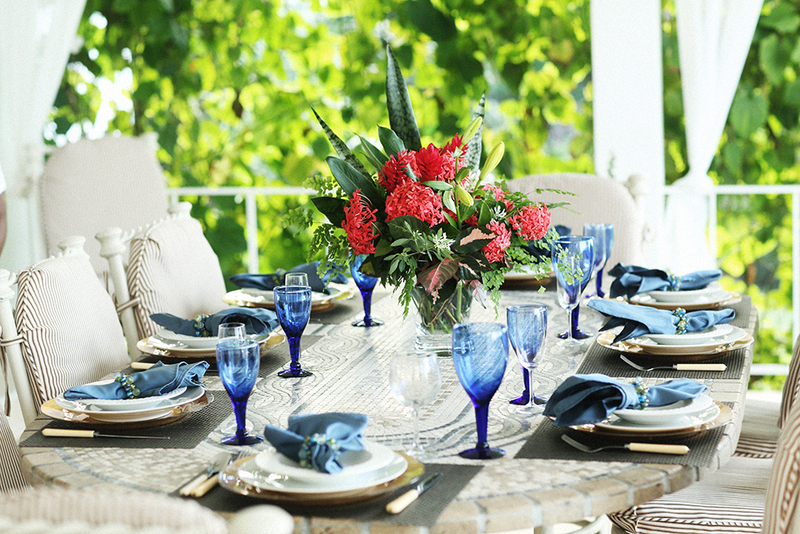 Lunches are served on the dining verandah or at shaded poolside umbrella tables. 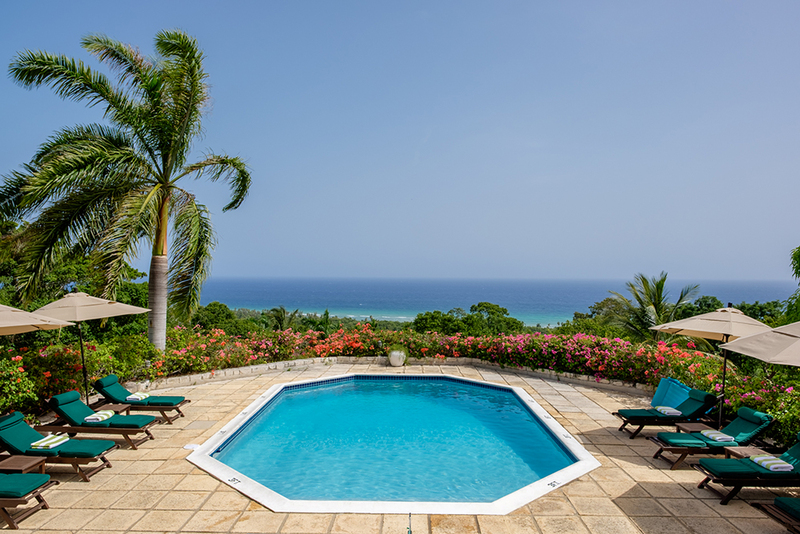 The large octagonal private pool has beautiful teak chaises with plump cushions. 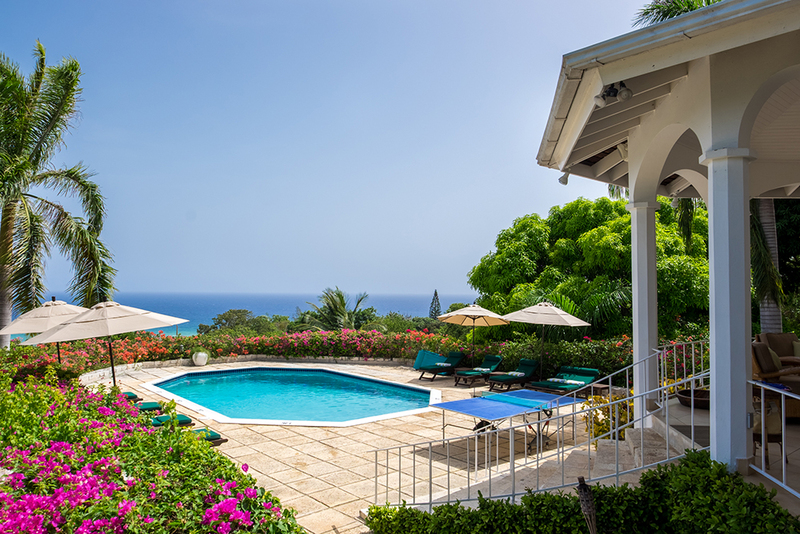 A stone terrace wraps around the Caribbean side of the villa. 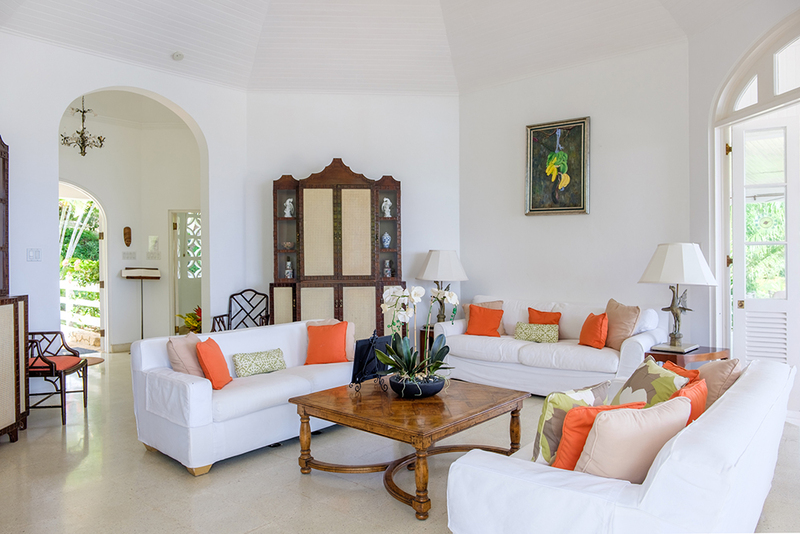 The living room and five bedrooms adjoin this long terrace via French doors that fold back so each doorway opens wide to the vast blue sea view. Five bedrooms are on the main level and one is downstairs. 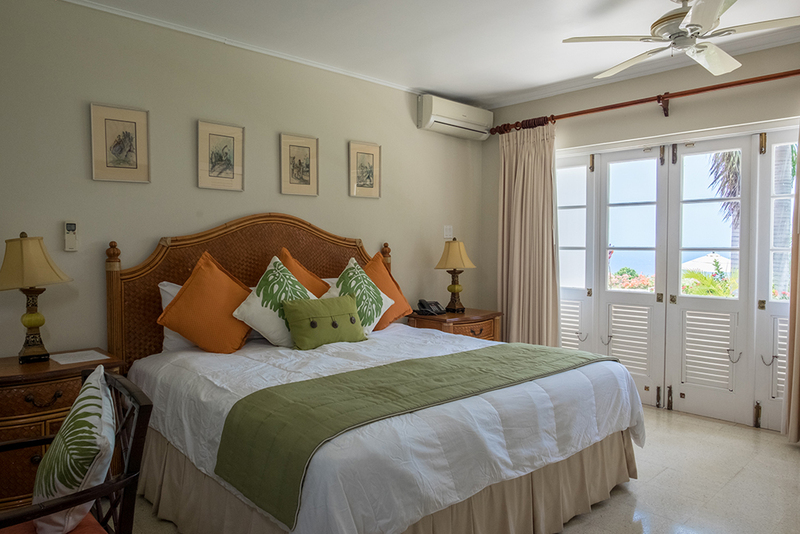 All bedrooms are air conditioned, and five of the bedrooms have Bose iPod docks, telephones with room-to-room intercoms and cable television. 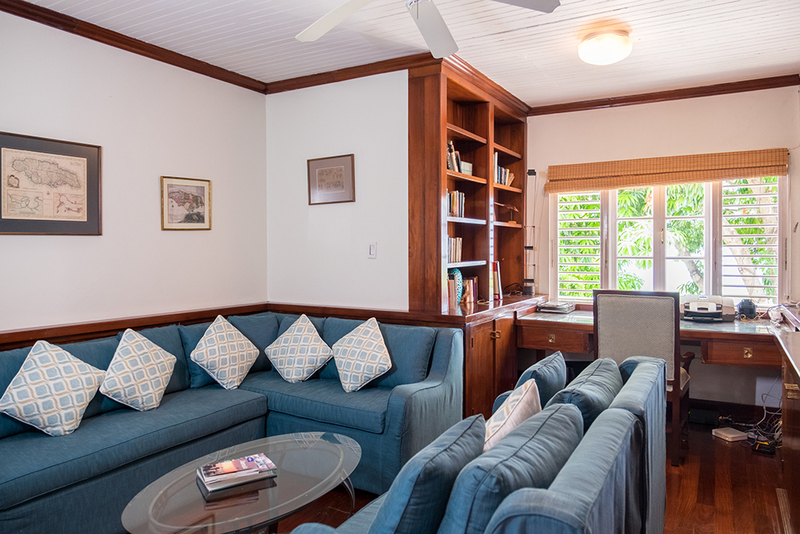 Five bedrooms have wide doors that open to a wrap-around furnished verandah. Another bedroom opens to a small den and adjoins to the outdoor dining area. 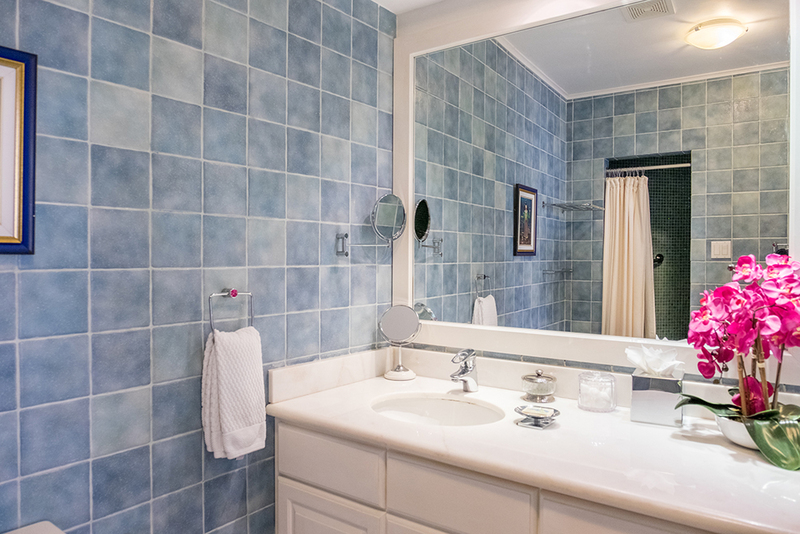 All bathrooms are newly renovated with state-of-the-art Grohe and Italian Toto fixtures and granite counter tops. 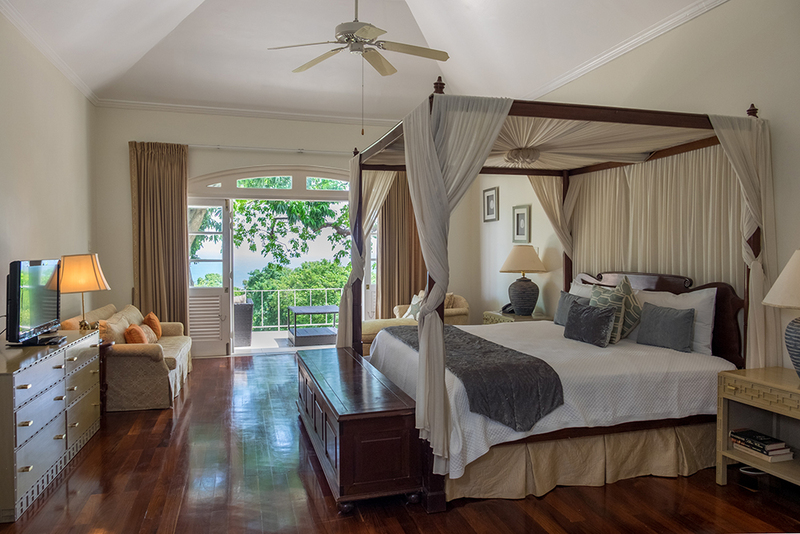 King size four-poster mahogany bed in large room, en-suite bathroom with two-person Jacuzzi tub and walk-in shower. 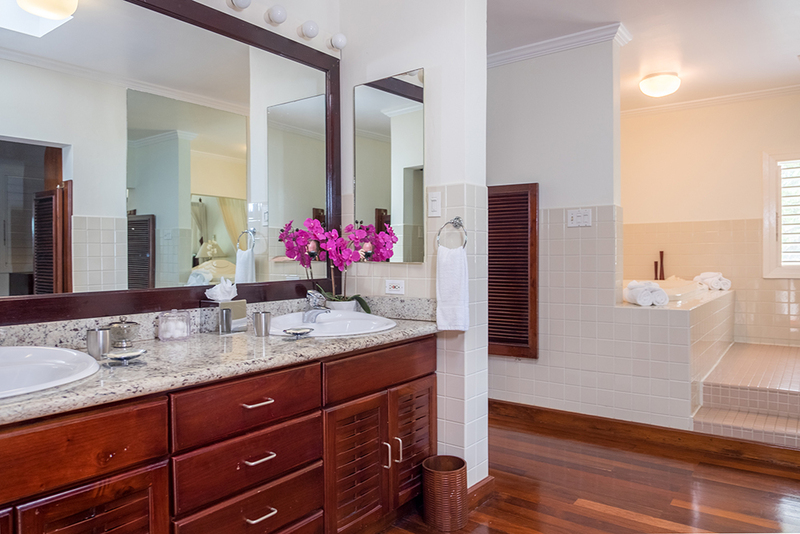 Dressing room with his & hers vanities and double sink basins. This suite includes a den with 42" home cinema, DVD, sound system, copier and fax. 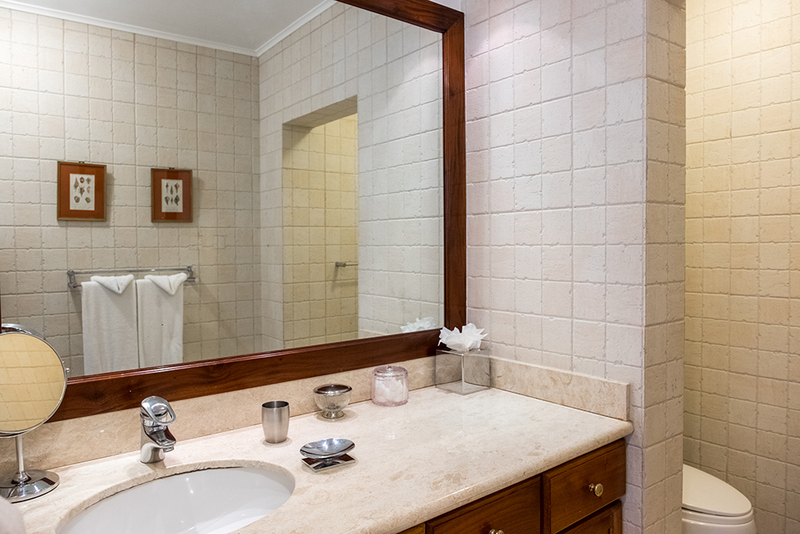 King size bed, makeup area, large bathroom with bidet and bathtub-shower combination. 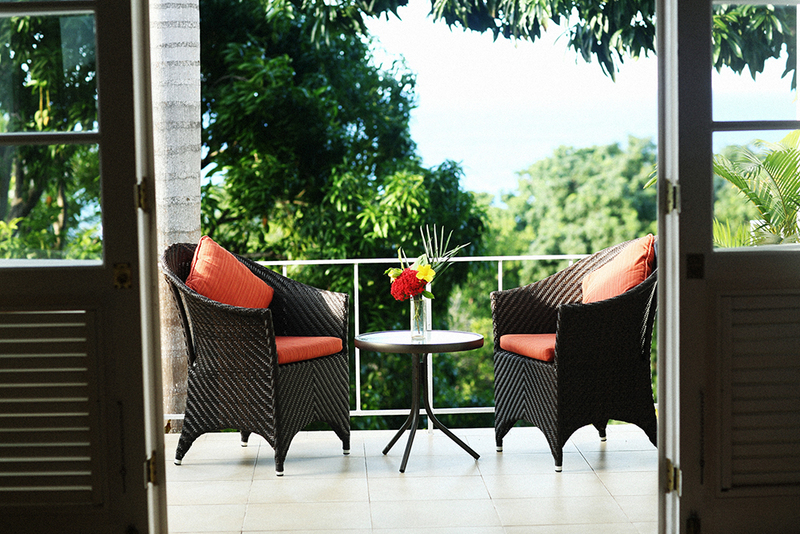 All Chippendale furniture was made in Jamaica in the 1960's and carefully restored this year. 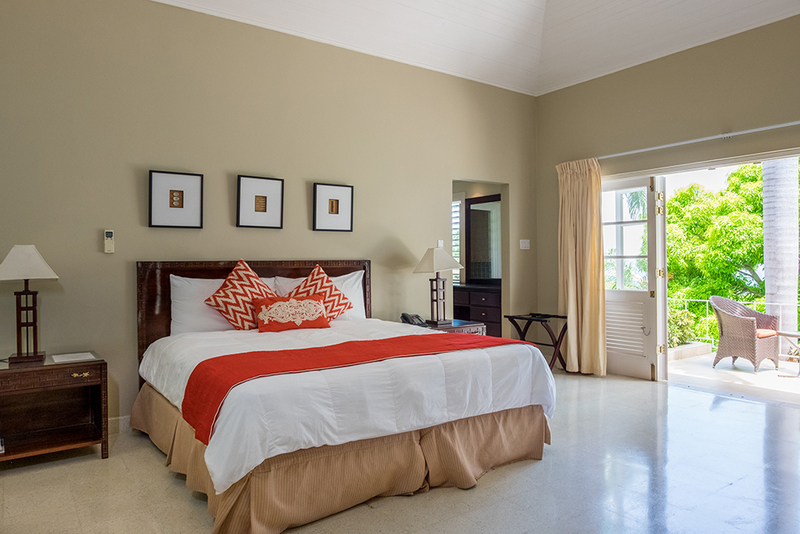 King size bed, large en-suite bathroom with walk-in drench rain shower. Optional king size or twin beds, en-suite bathroom. 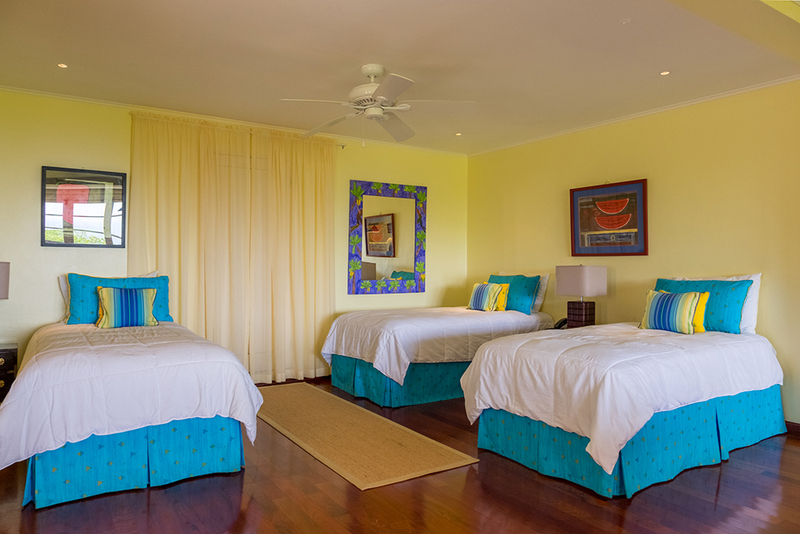 Optional king size or twin beds, private bathroom. This room is on the other side of the house from the other bedrooms. There is a small den that is next to this bedroom with a 32" flatscreen TV. 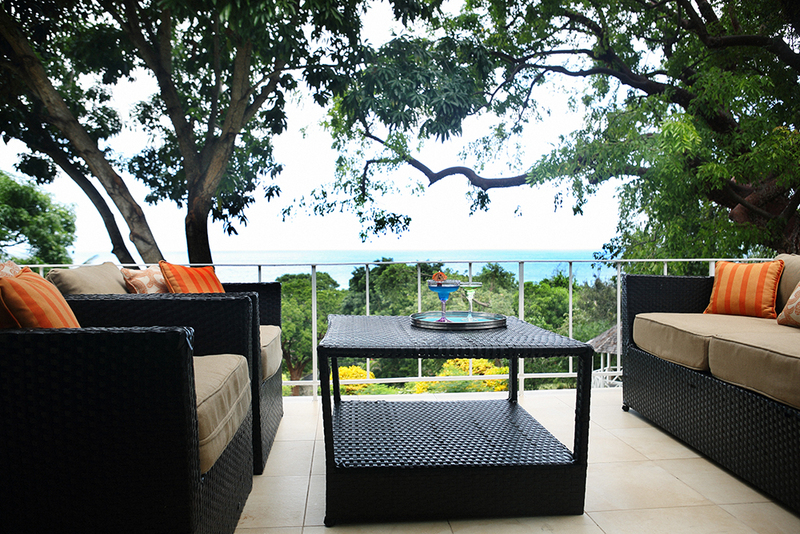 The outdoor dining area adjoins this area. Option of three twin beds ~ or one twin bed plus one king size bed. 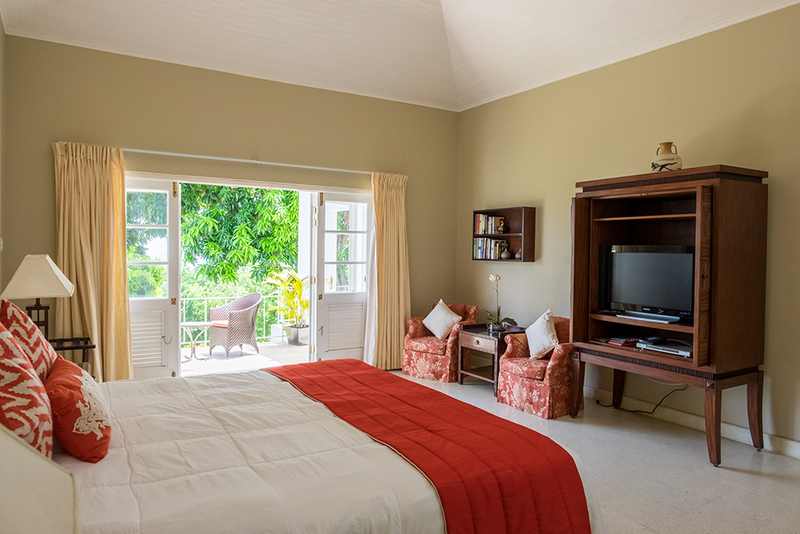 Extremely spacious room with pool table, wall-mounted 40" television, kitchenette, and en-suite bathroom with walk-in shower. Accessed by exterior spiral staircase. 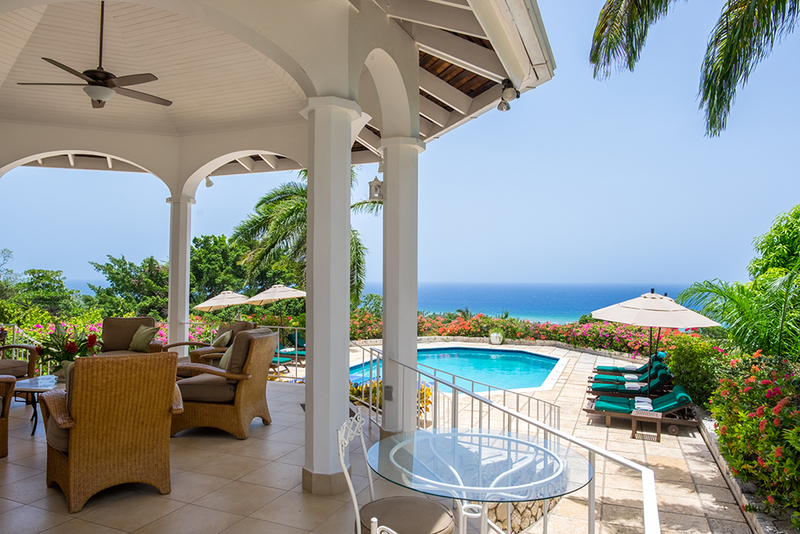 Opens to private terrace and pool. Suitable for adults, teens or a family. Loved the staff, concierge service and the cleanliness of the villa. We also love Half Moon Bay Golf Course. Staff worked very well together. Cohesive group, and villa is lovely. Everybody is extremely nice and helpful. Minor problem was taken care of immediately! Great villa and great staff. The staff is very capable and willing to please. 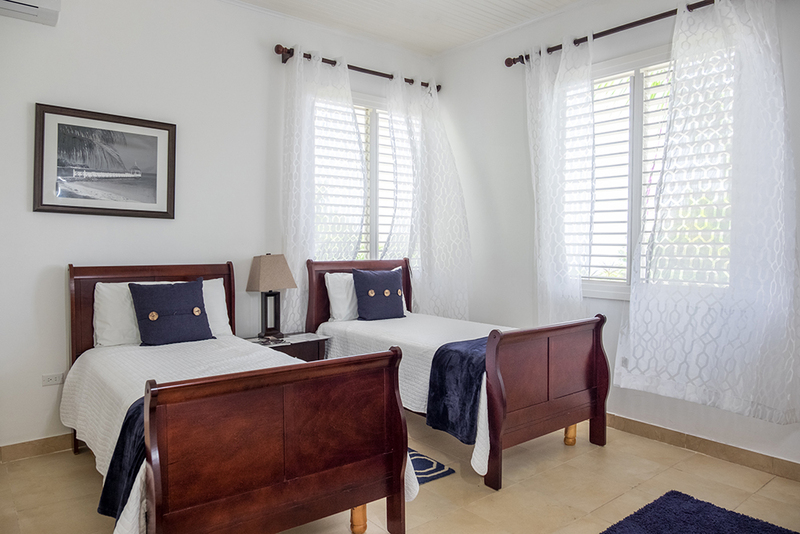 The villa is well-maintained and lovingly cared for. 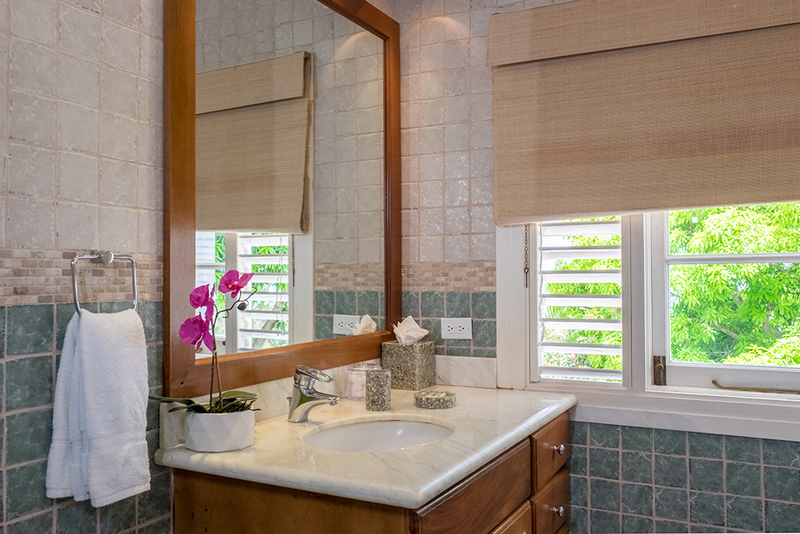 The staff, Half Moon resort amenities and beauty of the villa would bring us back. We always have a great time in Jamaica. The staff and house were absolutely wonderful. I can‘t thank you enough for making our 2012 family spring-break vacation one of the most memorable ones we have ever had. 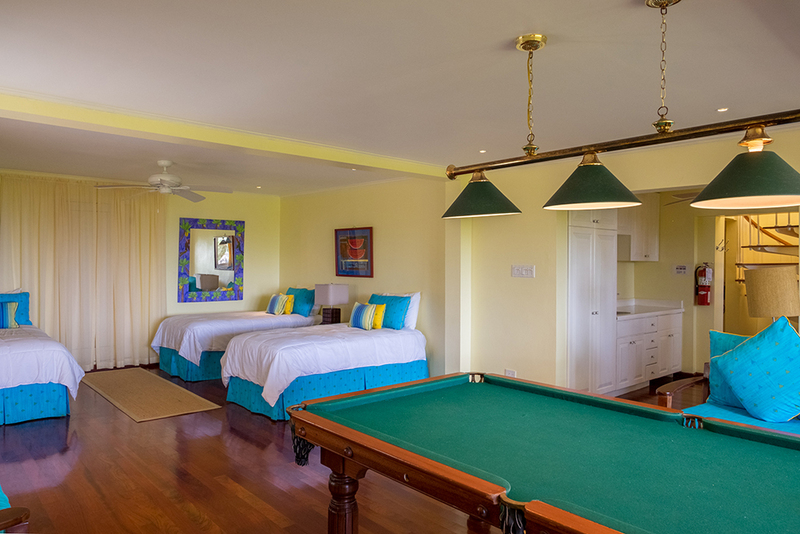 We just returned last night and wanted you to know how much we loved Nutmeg and the Half Moon Resort facilities. We used the gym every day, and played 5 rounds of golf without green fees. 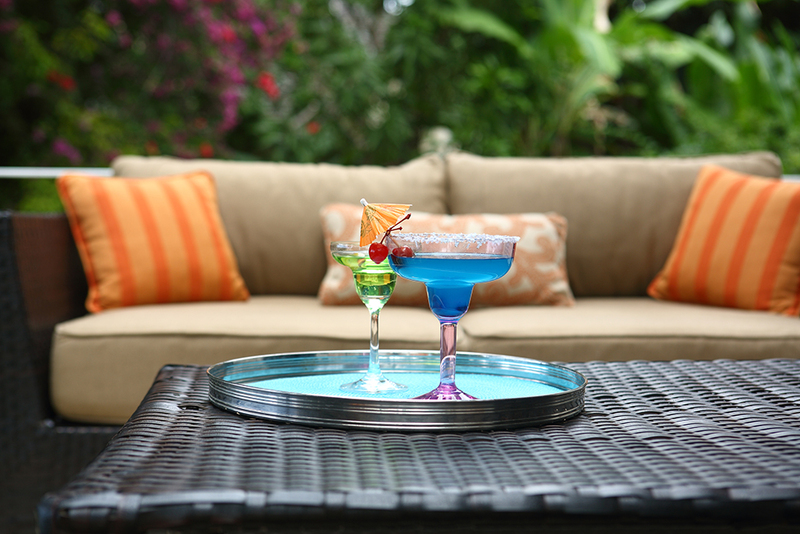 Great selling points to get guests to return. We all decided that we would most certainly return to Nutmeg and recommend Nutmeg to our friends.